It’s hard to beat perfect binding for a look and feel of completeness and professionalism. It just seems to say, the content in here is important. Perfect binding is also very versatile in terms of what can be bound. You can bind in two-page signatures, which allows you to produce the best page count for your situation and also permits inserts. (A “signature” is a group of pages that are folded together in groups. You bind several signatures, rather than binding separate sheets.) In fact, perfect binding can accommodate almost any kind of insert — fold-outs, response cards, tear-away envelopes, magna-strip tip-ons, sticker pages, and many other kinds. But even with its advantages, as Adam Trull of Acme Printing recently pointed out , perfect binding isn’t without its challenges, whether you contract out the job or do it on your own bindery equipment. One challenge is cross-overs — images that straddle the gutter between adjacent pages. Cross-overs don’t necessarily preclude the use of perfect binding, but there several details to be addressed in order to get properly aligned cross-over images in your perfect-bound book. Before committing to perfect binding, you should make sure your pre-press professionals and printing team have experience setting up and producing perfect-bound books with cross-overs. Another factor is spine strength, which is usually measured by a machine that holds the book open and pulls on a center page until it separates from the spine or tears. The industry standard is 2.5 pounds per linear inch. Spine strength is a more important consideration for oblong books because they tend to lie flatter, thus putting more strain on the spine and making it weaker. Obviously, your choice of glue will affect the perfect-bound book’s spine strength. EVA (ethylene vinyl acetate) is most often used for books that will be read casually. PUR (polyurethane reactive glue) is stronger, but it costs more and requires 24 hours to dry. In either case, it’s a good idea to keep ink and varnishes out of the glue area so the glue gets a better grip on the paper fibers. 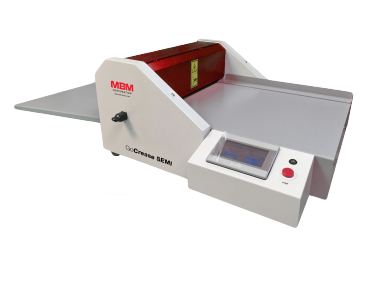 If you need to produce perfect-bound documents frequently and in various quantities, you should consider purchasing your own bindery equipment so you can produce a variety of perfect-bound documents on-demand.